If your lawn was more of an eyesore than an asset this summer, it’s not too late to do something about it. In fact, your timing couldn’t be more perfect. That’s because autumn, not spring or summer, is the very best time of year to plant a new lawn. Autumn’s cooler, damper weather allows grass seed to quickly germinate and take root, while discouraging the growth of crabgrass and other lawn-choking weeds. Here, I’ll explain the eight key steps to seeding and caring for a new lawn. Keep in mind, however, that prepping the soil prior to planting is the most critical step in the process. Carefully follow each step and you’ll be rewarded by a lush, green lawn come spring. Begin by testing the pH (acidity/alkalinity) level of the existing soil. (Do-it-yourself soil kits are sold at garden shops and home centers for about $15.) Put measured amounts of soil and water into the plastic test chamber and shake well. Wait a minute or two for the soil to settle and the color to develop. Next, hold up the plastic vial and compare the color of the soil solution to the color-coded chart printed beside the test chamber. It should read between 6.5 and 7.0. If the soil is slightly acidic, raise the pH by adding pulverized limestone. To lower the pH of moderately alkaline soil, add organic material, such as peat moss. For soil with very high pH levels, amend it with sulphur or iron sulfate. For more comprehensive soil testing, contact your county’s cooperative extension office. Dig up all rocks and roots that are visible using a shovel. For particularly stubborn or large rocks, use a fiberglass-handle shovel; it’s much stronger and less likely to crack than a wood-handle shovel. After digging out all exposed rocks, use a garden rake to smooth the soil. Remove from the soil any stones that don’t fit through the rake’s tines. Also, pick up and discard all excavated debris, such as clumps of dead grass, loose roots and exposed sticks. Then, fill all holes and depressions with topsoil to level out the ground. Cover the planting area with 6 to 8 inches of manufactured loam, which is a mixture of screened topsoil, compost and sand. Loam costs between $15 and $25 per cubic yard delivered, and 20 cubic yards of loam will cover about 1,000 square feet to a depth of 6 inches. Use a wheelbarrow to distribute piles of loam around the site, then take the garden rake and spread the loam to a consistent depth of 6 to 8 inches. Add more loam, if necessary, to fill in low spots. And if you see any remaining rocks or roots on the surface, pick them out and discard them. If the test conducted in Step 1 indicated that the soil is slightly acidic, now’s the time to add pulverized limestone. Lime will balance the soil’s pH level, but also boost nutrients by providing two important minerals: calcium and magnesium. Apply the lime using a walk-behind broadcast spreader. Don’t own a spreader? No worries, you can rent one at most local home centers or tool-rental dealers. Spread lime over the entire area, making sure you don’t miss any spots. Next, use the broadcast spreader to apply starter fertilizer. Again, full coverage is important. And don’t try to spread the lime and fertilizer at the same time; they must be applied at different rates. After adding both amendments, take a garden rake and carefully work the lime and fertilizer into the top 1 inch of soil. Now comes the fun part: sowing the grass seed. Use a handheld, crank-operated broadcast spreader to disperse an even coating of grass seed over the amended soil. Simply crank the handle to scatter the seed. If you’ve got a really large lawn, you could use a walk-behind spreader, but the handheld spreader works pretty quickly. As a general rule, you should apply about 4 pounds of grass seed per 1,000 square feet of lawn. When over-seeding a thin, partially bare lawn, reduce application to 2 pounds of seed per 1,000 square feet. After spreading an even layer of grass seed over the amended soil, it’s important to rake the seeds into the soil to ensure they quickly take root. However, don’t use the garden rake. Instead, take a plastic leaf rake, turn it upside and use the back of the tines to gently work the seeds into the soil. Make short, light strokes with the rake. Avoid long sweeping motions that can unevenly redistribute the seeds and cause grass to grow in clumps and uneven patches. Immediately after sowing the seeds, and I do mean immediately, lightly water the area with a fan-type or oscillating lawn sprinkler. For the first eight to 10 days, water two or three per day, but only for five to 10 minutes. It’s important to avoid over-watering—a common mistake—because the resulting runoff will wash away the seeds. Also, note that it’s best to water in the morning, when there’s less evaporation from the sun. Set up one or more sprinklers, as necessary, or just move the sprinkler to different areas to ensure that the entire lawn gets dampened. And once the grass begins to sprout, reduce watering to once a day for 15 to 30 minutes. After investing so much time and expense in seeding your new lawn, it’s important to follow up with a little routine maintenance. 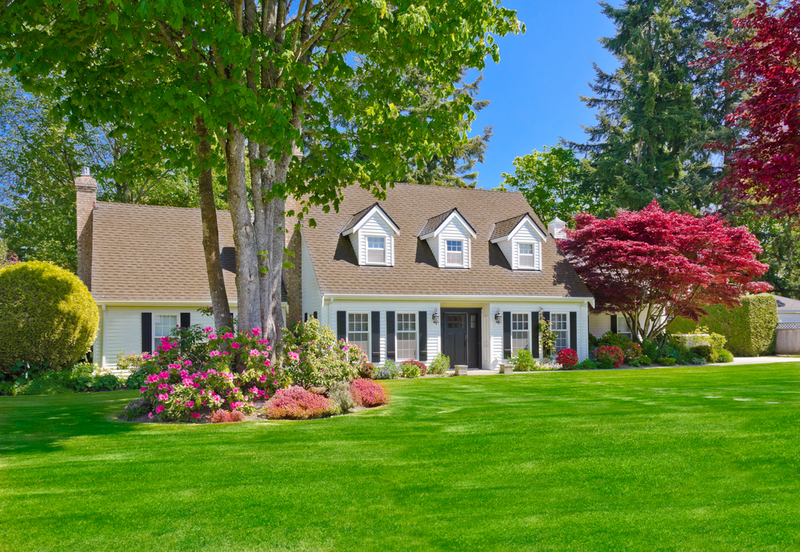 Here are 12 steps to take to ensure your lawn stays lush and healthy for years to come. Mow the lawn for the very first time when the grass is about 3 1/2 inches tall. Trim off no more than one-third of the grass leaves. Be sure the mower has a sharp blade and collector bag. If you don’t catch the grass clippings, they’ll clump together and smother the new seedlings. Make wide, gentle turns with the mower to prevent its tires from pulling out the seedlings. Apply a second dose of starter fertilizer four weeks after sowing the seeds. Once the lawn is established, the grass needs about an inch of water per week during the summer. But, be careful not to over-water, which keeps the roots in the upper soil levels and prevents the grass from becoming deeply rooted. Eight weeks after seeding, treat weeds with an herbicide that’s specifically formulated for use on grass. Each March, treat the lawn with a pre-emergent crabgrass control agent. Apply a broadleaf weed-control agent in June or July. In early-fall, aerate the lawn and apply another dose of grass fertilizer. Also, test the soil and add lime, if necessary. In late-fall, rake up all fallen leaves to prevent them from smothering the grass. Then, apply a winterizer blend of fertilizer. In late-fall or early-winter, mow the lawn for the last time of the year, cutting the grass about 2 to 2 ½ inches tall. For information about innovative tools from WORX please visit www.worx.com.